Here is SHR Advantage of Bat Masterson aka Bart. He received his HRC Started title at age 3 1/2 months. Our intensive training works for dogs of all ages they eat up the 2-3 times per day training opportunity and we are turning out great dogs. Our March Texas trip we had 22 passes out of 26 tests, 4 titles. 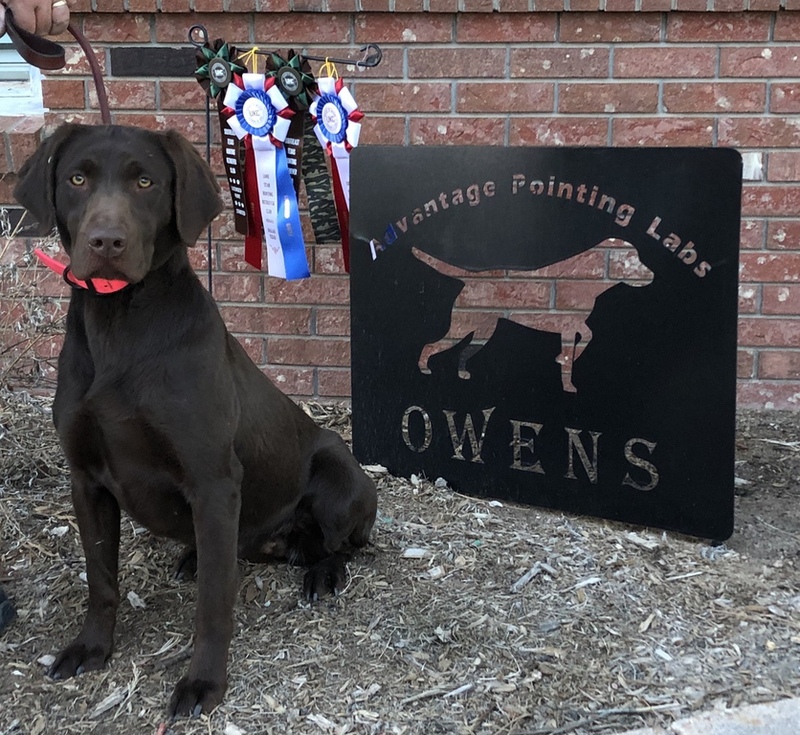 If you are like most folks out there you want a dog that is dual functional while at home a fluffy family member and when you go hunting you want them to perform their very best. 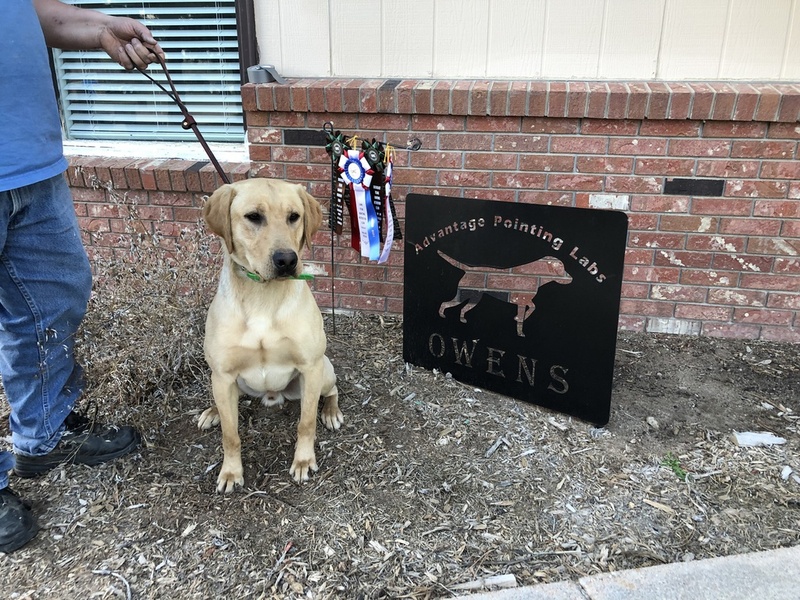 Advantage Pointing Labs has helped many people train their furry family member to be the best retreiver, pointer, or flusher that they can possibly be. Your family member becomes our family member and we will take care of them just as we would our own. We are low force trainers. We do not believe the pup should ever experience pain during training or any other time. We believe pups should not ever be deprived of food, water, or shelter. We use our ecollars on low or vibrate as a reinforcement to our commands that we have already taught. We have successfully trained dogs that have failed out of other programs and we tailor their training experience to the dog. For example instead of Force Fetch we have had to Love Fetch a few dogs. Our program is called Intensive Training. The word intensive should not be confused with a lot of force, but it means alot of time. We spend an enormous amount of time each day with each client dog. Our program works best and the dog learns the fastest with three sessions per day. We do offer month to month training, but usually our 3 month Intensive training works out better for the dog and the owner as repetition leads to perfection. Repitition sets the dog up to succeed for the rest of their lives. During our training program we put in the time and training equivelent to the usual 6-9 months program. If the dog is not where we want it to be at the end of 3 months we give you another month for free. You and your dog are our business card and if you succeed we too will be successful. How our program has evolved. Seven years ago we started the program and found we could take a beginning dog and we could get all the basic skills in, plus force fetch, steadiness to wing and shot, double 100 yard plus retreives on land and water, and beginning hand signals in a short 6 week program. Each dog received at least 3 sessions each day including weekends. 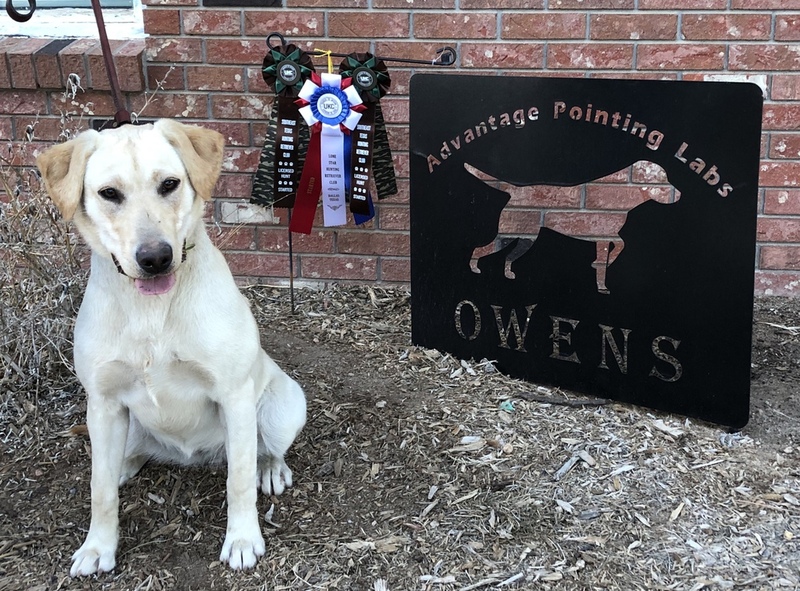 The pups thrived on the program, they loved it, and usually went home in 6 weeks with HRC started title and an APLA Certified Pointer Retriever title. However they were just getting to know hand signals and six weeks just wasn't enough time for most of the pups to become proficient at hand signals they needed more repetitions, so we now have a 3 month program. Without your involvement you will not reach the pups full potential. You are welcome to come any day and lend a hand or see your pups progress. 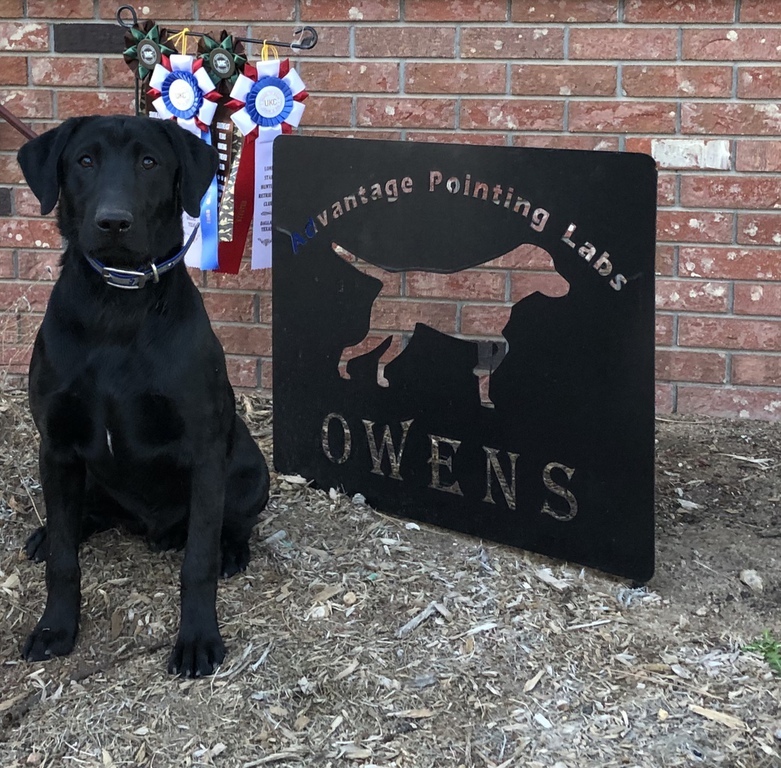 Along with training the pup we assume we will also need to train the owner on commands and use of the ecollar including the do and do nots of gun dog training and living. 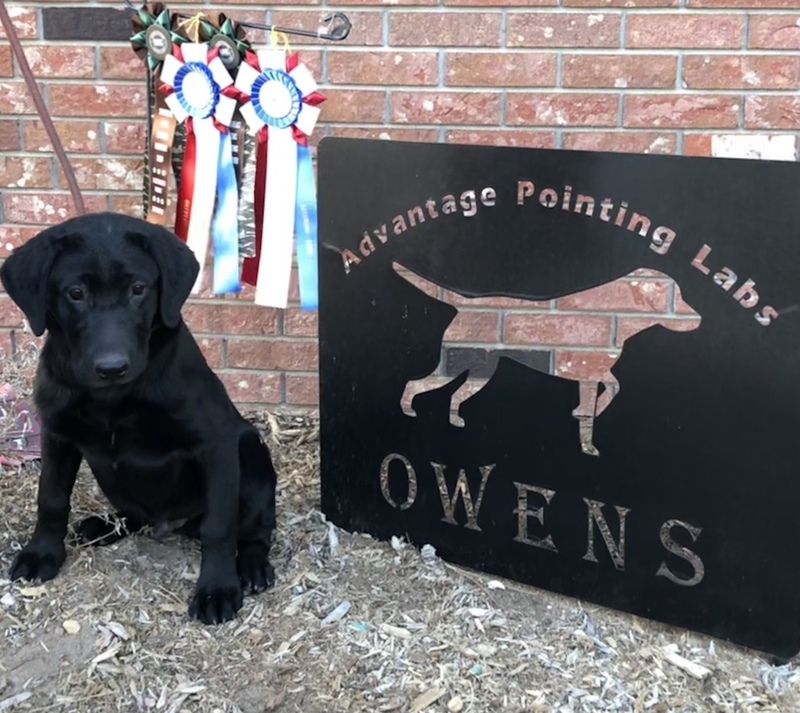 If you are a distance client you can rest assured, we will upload weekly videos of your pups progress to our facebook page "Friends of Advantage Pointing Labs". The outline below covers a quick overview of our program. Each lesson from week 1 through the end is covered each week during training. Repetition equals perfection! Please realize that the word "force" is a training term meaning we expect the pup to follow the command they uderstand when given and the force part is we give low ecollar stimulation to encourage immediate obediance. Week 1: Safety Commands "Sit" "Here" "Heel" "Kennel" "Ecollar Conditioning"
Week 2: Functional Obedience: "Whistle Sit" "Whistle Resume" "Sit Means Sit" "Force to Here" "Force to Kennel"
Week 3: Review week 1&2 start "Whoa" training and "Whoa on live Birds"
Week 4: Table work "Hold" "Drop" and the formal "Force Fetch"
Week 5: Continued Force Fetch: Move from ear pinch to collar fetch then to "Walking Fetch" "Fetch No Fetch". Week 6-8: "Back" Command ,Pile Work then "Force to Pile" , Remote "Whistle Sit" Continued Who on birds if a pointing dog, "Delivery to Hand" "Right Back" "Left Back"
Week 11-12: Basic T and Double T. "Over"
We also offer a 4 week upland only training session mid October through 2nd week of November. For a full program email me and I will send you a sheet that explains a bit more what is going on each week and pricing. Thanks for your consideration!